Each year at the National Catholic Educational Association’s convention a highlight is the presentation of the “Lead. Learn. Proclaim.” awards which, despite the unusual punctuation, really are a big deal. This year’s awards, which will be presented on April 3 at the NCEA convention in Cincinnati, will honor 26 individuals or groups involved in Catholic elementary and secondary school education. An unusual distinction this year is five of those national awards will go to educators in one diocese – Philadelphia. Only two other dioceses saw multiple recipients, Chicago and Cincinnati, which received two each. Of the five Philadelphia awardees two are from a single parish: St. Andrew, Drexel Hill. Msgr. Albin Grous, the pastor, and Helen McLean, the principal, received separate awards. McLean, who has been at St. Andrew her entire teaching career and principal since 2006, credits Msgr. Grous for turning the school around. If there was an initiative the school wanted, whether it was a science lab or the Catechesis of the Good Shepherd, the pastor found the financial means to support it, McLean said. It took a couple of years for results to show and enrollment bottomed at 235 in 2009. But as smaller graduating classes were replaced by larger new admissions, the school took off. Every year since 2009 has seen an increase and presently it stands at 425, with expectations of continued growth for next year. At this point the school is running out of space and conducting a capital campaign to build a new addition. Now every grade has gone from one classroom to two except for the eighth grade, whose students were the last first graders to enter during the lean years. Next year, eighth grade will also have two classrooms. “Our pastor will tell you he just shed the light on the good things that were here already, but he made all the difference in the world,” McLean said. She also cites good, solid programs and support from parents and teachers. “We are financially responsible and I think a lot of credit is due to what the school has done by being strong in Catholic identity and academic excellence,” Msgr. Grous said. As a pastor he has to have a team he can trust and he has that, he added. St. Andrew School charges a uniform tuition of $3,675 for the first child, and descending rates for the second or third and none thereafter, with financial aid available for families who cannot afford it. A unique feature of the tuition plan is that it is the same whether the parents contribute to the church collection, go to church or are even Catholic. This may seem counterintuitive, but Msgr. Grous maintains it is not. The proof is as enrollment has increased the parish subsidy has decreased from about 25 percent to 8 percent this year. “Empty seats do not earn revenue,” Msgr. Grous said. “It is good business practice. If I have empty seats I am not going to sell them at a premium to non-Catholics just to fill them. The student body does not determine the Catholicity of the school. The school does, the pastor does and the family does. “For me,” Msgr. Grous said, “the primacy of the Lord is paramount. If we try to imitate the public schools we are not going to make it. We are unapologetically Catholic. “We have to take some responsibility for the lack of catechesis of the parents, and they are coming back. Even if we talk about 30 or 40 or 50 percent who are not donating, they are looking for a good school for their children and we are providing that. Other “Lead. Learn. 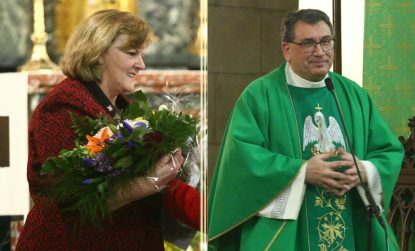 Proclaim.” awardees in the Philadelphia Archdiocese are Sister Margaret Rose Adams, I.H.M., principal of Queen of Angels Regional School in Willow Grove; Colin Hueston, chairman of the board of SS. Peter and Paul School in West Chester and Margaret Egan, principal; and Patricia Vernot, a teacher at St. Veronica School, Philadelphia.